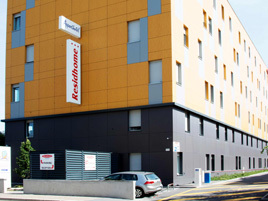 The Residhome Reims Centre serviced residence offers high quality apartments and hotel services. Located on the Promenades de Reims, the residence enjoys an ideal location, near major highways and the central train station, which is just 200m away. Discover the charm of France's history in this city of rich historical and architectural treasures: the Cathedral of Reims, where the kings of France were crowned, the 11th century Saint-Remi Basilica, and the Fine Arts Museum. Whether staying for business or pleasure, don't miss a visit to the great champagne houses. Open 24 hours, the serviced residence is made up of 76 studios with a kitchen area (glass-ceramic cooktop, microwave, and refrigerator), a bathroom, and a flat-screen television. You will appreciate the amenities and services available to you free of charge such as internet access (Wi-Fi connection). Several supplementary services will make your stay a smooth one: breakfast, laundry facilities, parking, etc.